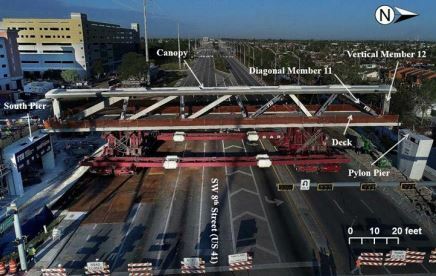 On Aug. 9, the National Transportation Safety Board released the latest update on its investigation into the March 15 Florida International University pedestrian bridge collapse. It still, however, isn’t ready to identify the probable cause of the structure’s failure despite photo evidence of cracks — some fissure-like — in the bridge deck and other areas, presumably that developed after the prefabricated span was set in place just a few days before the fatal incident. The bridge was transported into position from its offsite location on March 10 to much fanfare, while its building method, accelerated bridge construction, was touted as a way to deliver such structures with minimal interruption to traffic. Five days later, the bridge collapsed onto vehicular traffic below, killing six — one bridge worker and five vehicle occupants — and injuring several others. The collapse occurred while workers were tightening, or re-tensioning, steel rods at the bridge’s north end, including at diagonal member 11, after they were de-tensioned on the day of the move. 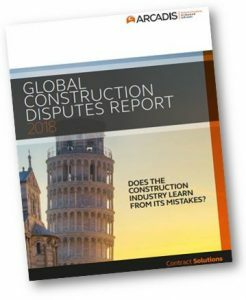 Construction contract disputes across the world are getting longer, more complex and more expensive, according to the “Global Construction Disputes Report 2018” from design and consultancy firm Arcadis. The value of North American disputes — or total costs added to a project for the additional work being claimed — dropped for a fourth consecutive year to $19 million in 2017, compared with the $43 million global average, the report found. Meanwhile, the average length of North American disputes increased from 15.6 months in 2016 to 17.7 months last year, exceeding the global average of 14.8 months. 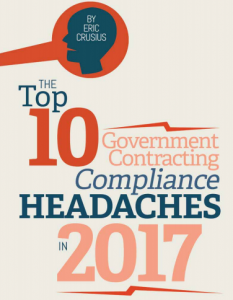 Contract errors and/or omissions were the top cause of disputes in North America last year, followed by poor contract administration, which was trailed by failure on the part of an owner, contractor or subcontractor to understand or comply with contractual obligations. Social infrastructure and the public sector collectively saw the most disputes while the transportation sector saw the second most. In the government contracting industry, compliance related issues tend to take place. With administration and party changes, 2017 promises to offer additional complexities. Confusion amongst government contracting professionals includes: compliance with the Service Contract Labor Standards, DoD source selection procedures and cybersecurity requirements. In addition to keeping your company in line and compliant with the expanding rights of government contractors, budget uncertainty, provisions of the NDAA and bid protests should also be addressed. Although more compliance issues may arise, it is essential to give attention to the policies that influence government contracting. 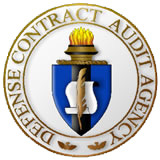 The recent limitation imposed on the Defense Contract Audit Agency to perform audits means private sector accounting firms now have the opportunity to work more closely with federal agencies to help assess proposals, indirect rates, and business systems of qualifying government contractors. This change has elevated the need for accountants specializing in government contracting who fully understand the criteria federal agencies use to select and retain contractors. Compliance and efficiency are paramount to not only achieving the government’s goals, but also for contractors to maximize their own opportunities afforded by a federal contract. With that in mind, we’ve identified the top five areas government contractors need to shore up to ensure their services are efficient and profitable. Poor IT contract management can cost your business time, money and legal fees. Here’s how to minimize risk by focusing on restructuring contract management and training employees around compliance. Managing IT contracts is sensitive business. Typically, corporate relationships and large sums of money are on the line. One Western Australian public servant recently learned the pitfalls of poor contract management the hard way. The employee overspent $40 million dollars on an IT contract in the healthcare industry. Similarly, Serco, a private security firm, found itself on the receiving end of over $68 million dollars in fines as a result of contract errors. And NHS Partners, a clinical services provider, found themselves out $1.2 billion dollars due to poor contract management. 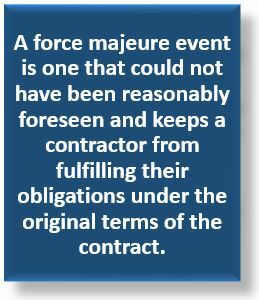 As those examples reinforce, the effects of mismanaged contracts adds up from legal fees and costing businesses large sums of money that they don’t need to lose. Georgia Tech is teaching a course beginning September 8th that is beneficial to both contracting officials seeking to hone their skills as well as contractors looking for insights into how the Government manages its contracts. The course — CON 090-4, Contract Administration in the Federal Acquisition Regulation — covers every aspect of post-award activity. This includes monitoring of the contractor’s performance, quality assurance, contract modifications, how terms and conditions are enforced, processing payments, handling disputes and appeals, terminations, and the contract close-out procedure. For government contracting officers, this course represents the fourth module of coursework required to maintain a contracting warrant. (A warrant is a written document providing a contracting officer with the limits of his or her authority. Per FAR 1.601-2, Contracting Officers have the authority to “enter into, administer, or terminate contracts and make related determinations and findings” to the extent of the authority delegated to them by their warrant.) Georgia Tech’s Contracting Education Academy offers a set of courses — each equivalent to Defense Acquisition University (DAU) course standards — that help contracting officials maintain their warrants and enhance their professional development. For businesspeople who compete for and fulfill government contracts, Academy classes are equally pertinent. Contractor personnel who attend Academy courses such as this one gain real-world knowledge about how government officials are trained to formulate and administer contracts. Insights in these areas provide invaluable guidance pertinent to reaching greater success in competing for, winning, and fulfilling government contract work. CON 090-4 is a five-day course being offered during the week of September 8, 2014 on Georgia Tech’s midtown Atlanta campus. CON 090-4 is part of an overall four-week course that deals with every aspect of the Federal Acquisition Regulation, the set of rules which govern the government’s “acquisition process” — that is, the process through which the government purchases (or “acquires”) goods and services. Since the CON 090 courses are designed as modules, they may be taken in any order. For more information on CON 090-4, including cost and registration, please visit http://www.pe.gatech.edu/courses/con-090-4-contract-administration-far. 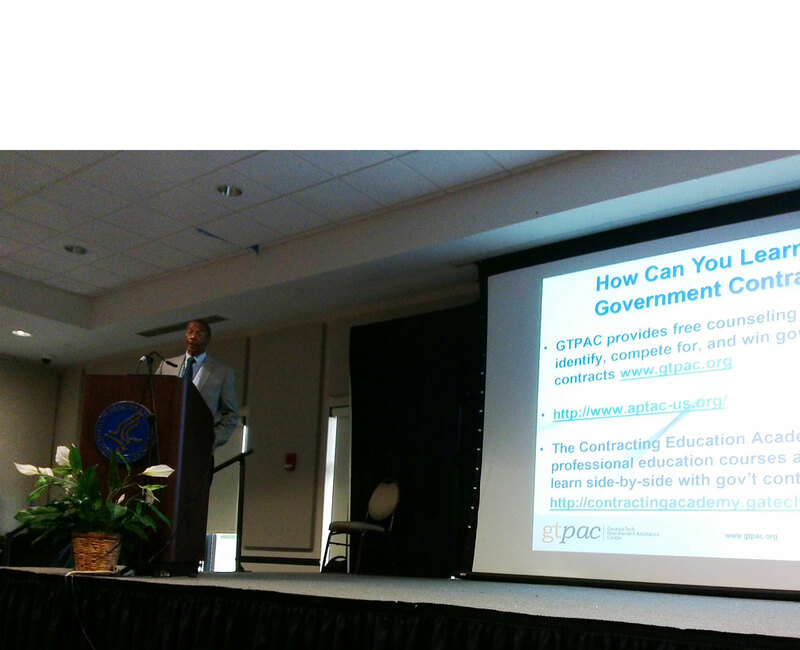 For information about the entire CON 090 course series and other courses offered by The Academy, please visit http://www.pe.gatech.edu/Subjects/Acquisition-Government-Contracting. The Veterans Affairs Department used inaccurate milestones for several of its health care center construction projects and hasn’t properly tracked project costs, said Linda Halliday, VA assistant inspector general for audits and evaluations before a Nov. 20 House panel. “VA needs better oversight, improved capital planning and stricter asset management to gain assurance that it can address construction and lease challenges more effectively,” Halliday said at the House Veterans Affairs Committee hearing. As of August 2013, only four of seven leases that came under IG review for an Oct. 22 report (.pdf), had been awarded and no HCCs had been built, despite VA’s target completion date of June 2012, Halliday said in prepared testimony.